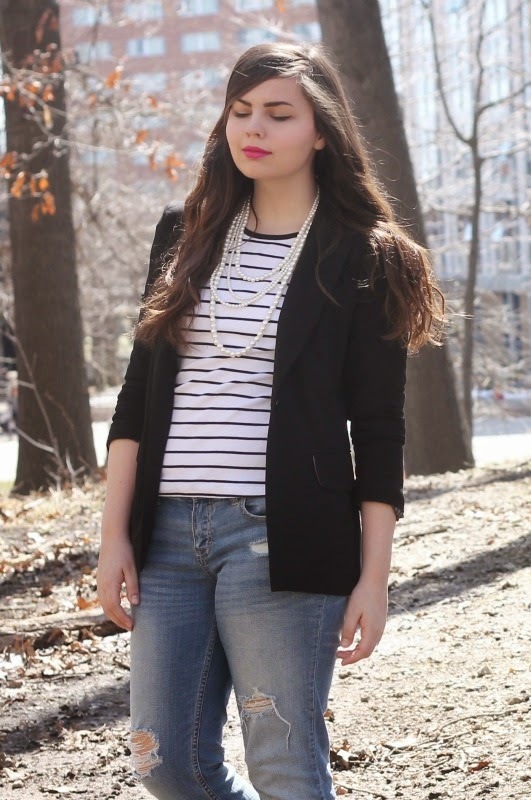 Striped Shirt, Black Blazer, Pearl Necklace: Forever21. I'm back from spring break and feeling good about the month and a half I have left of school. I didn't do too much over break besides a bit of thrifting and hanging out with my family, but it was perfect nonetheless. I did end up going on a date though! No, not with red headed soldier boy. I actually never heard back from him after our first date; I think he just understood that I wasn't really interested. But this date was with a boy from my home town whom I've been friends with since we were in middle school. Who knew dates could be actually enjoyable and not completely awkward? It definitely helps if you know the person before hand, that way you can relax and just enjoy the date instead of worrying the whole time about embarrassing yourself. Which I'm sure I still did anyways, but for some reason it just doesn't bother me like it would if I was with someone I wasn't previous friends with. This is a super basic outfit that I'm sure every single personal style blogger has on her blog. 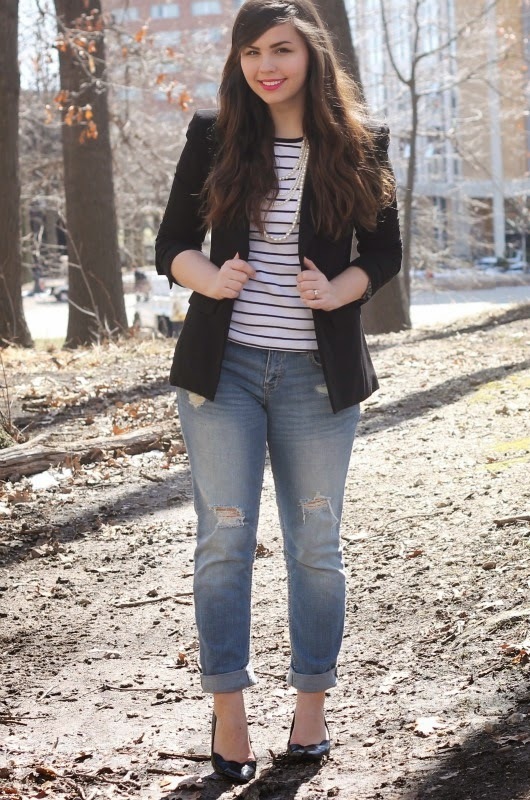 Striped shirt, tailored blazer, boy friend jeans, and simple heels. It all works so well together and I can't help but join the fan club on this outfit combination. There's something very classic about it that I love and hope to adopt more of this element into my wardrobe as I grow older. My roommate is really good at dressing very streamlined and put together in a timeless manner, but I tend very often to over do everything about my outfits. I'm hoping that Italy will simplify me and help me understand the importance of good basics rather than constantly competing pieces. That's a lovely outfit! I think it might be even prettier if you added just a bit of color though. Have you thought about that? Well, instead of doing a plain white necklace, you could get something with a little bit of color like the ones I sell here: https://www.etsy.com/shop/PearlFlowersShop. I think they would look awesome on you! You look so chic! Your smile really sets this outfit apart from those other fashion blogs - it's your best accessory! Lovely outfit, I love the back to basics thing you can never go wrong with it. I know I've done it once or twice. Once again... totally know what you mean about the competing outfit thing haha now that I think about I probably tend to do the same thing, it might be nice to take a simpler approach.